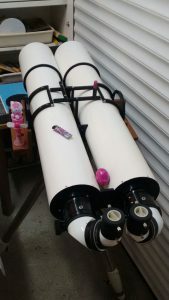 You can see the older posts at the Internet Archives, too. I hope you are well and safe from the storms that I have been watching on the news. 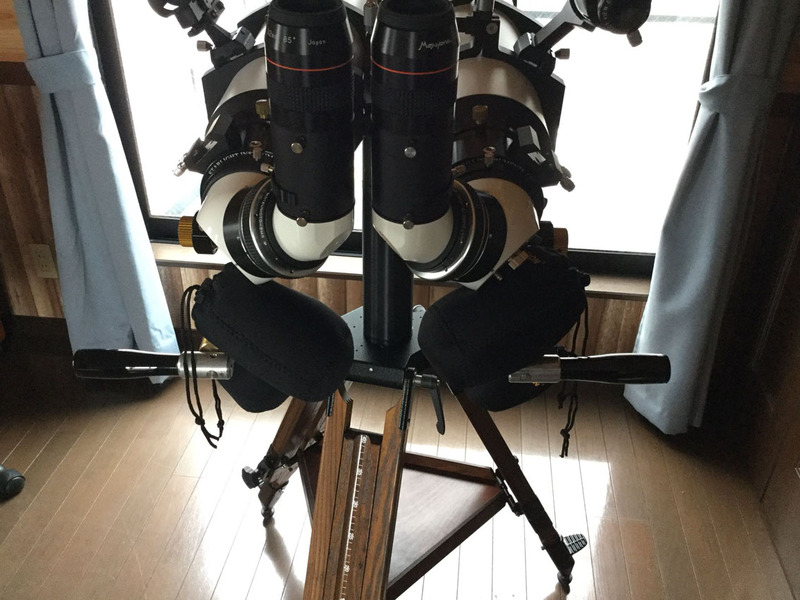 I recently decided to down-size my binoscope a little bit. 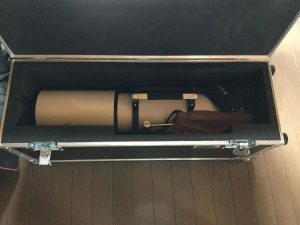 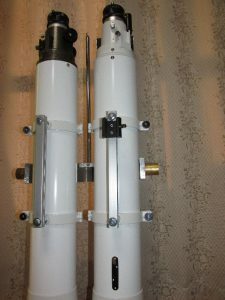 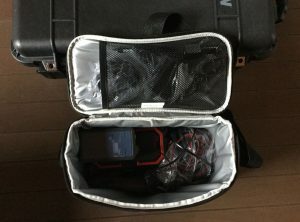 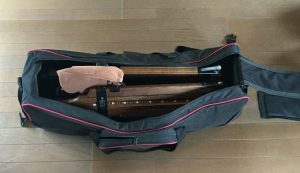 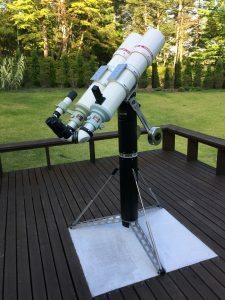 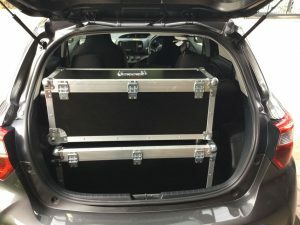 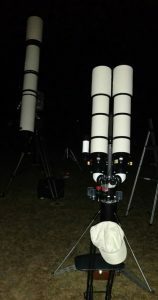 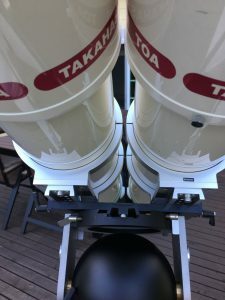 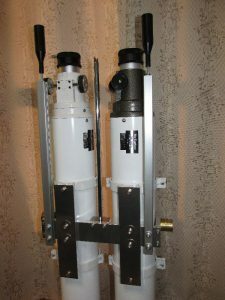 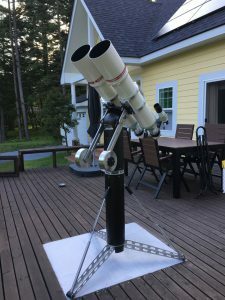 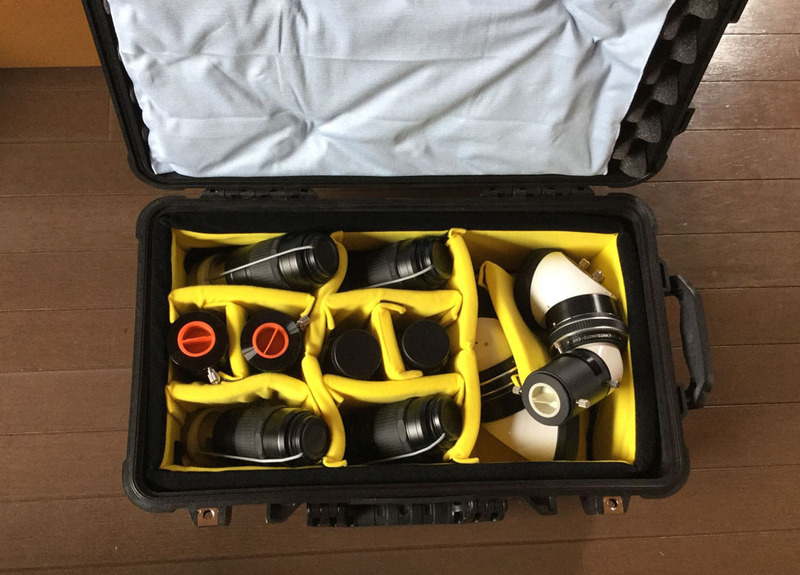 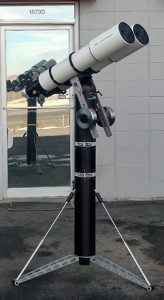 I replaced the two Takahashi TSA120 tubes with a pair of TSA102S to make for a lighter and more portable system as I also have an 18” scope I just completed. 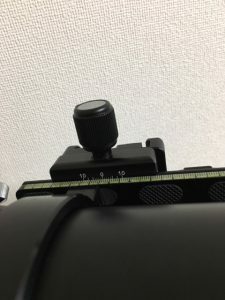 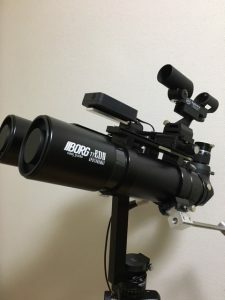 I have not yet had a chance to try out the smaller binoscope but I expect it will also be successful. 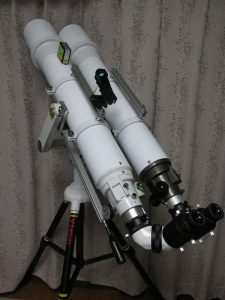 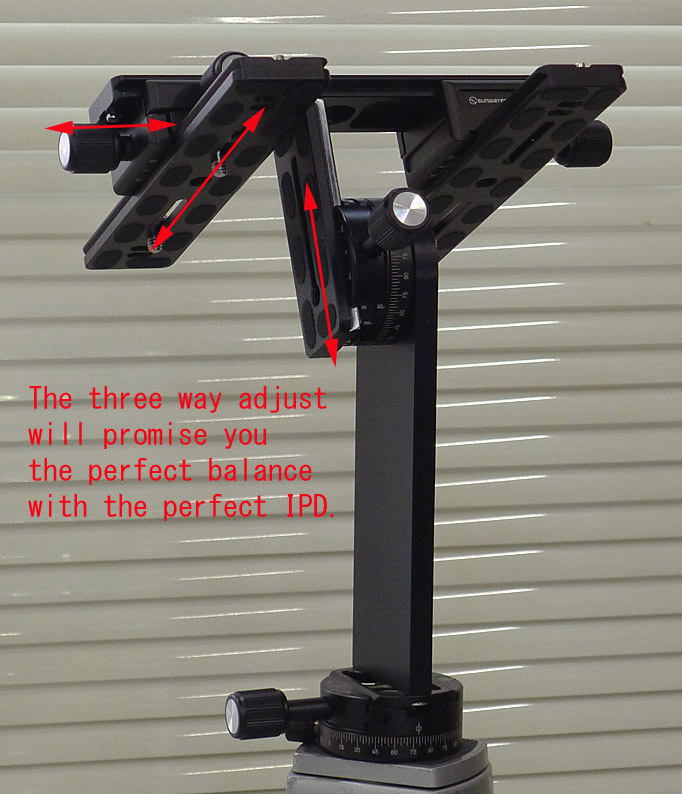 The EMS-ULS and adapters are a direct fit and there is enough back focus for it to work as well as the original setup. 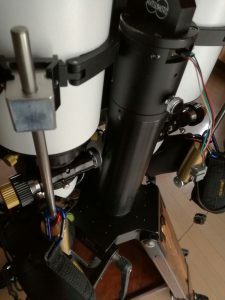 Range made a new cradle for me, I am using the same ‘D’ of 170mm so there is no need to adjust anything. 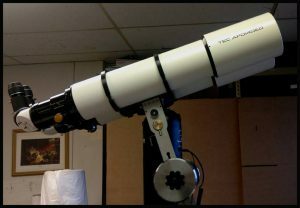 I took a couple of pictures today of the new setup. 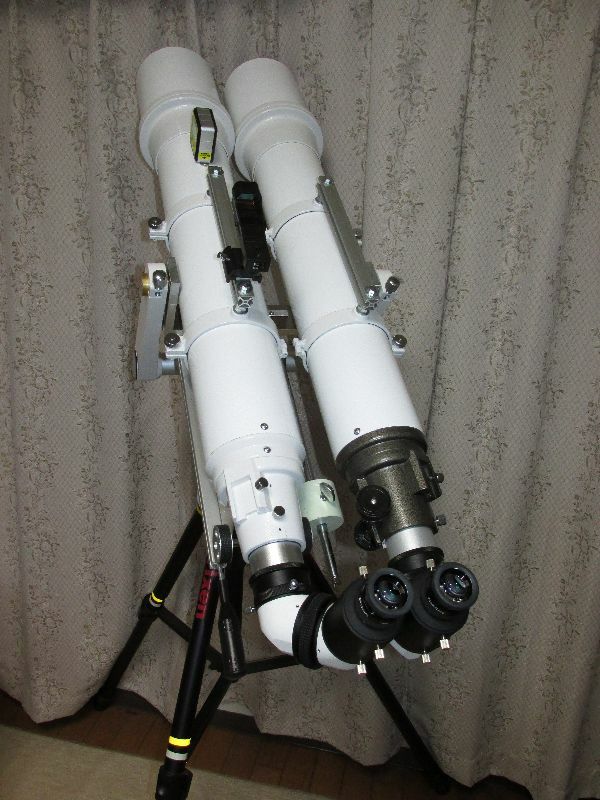 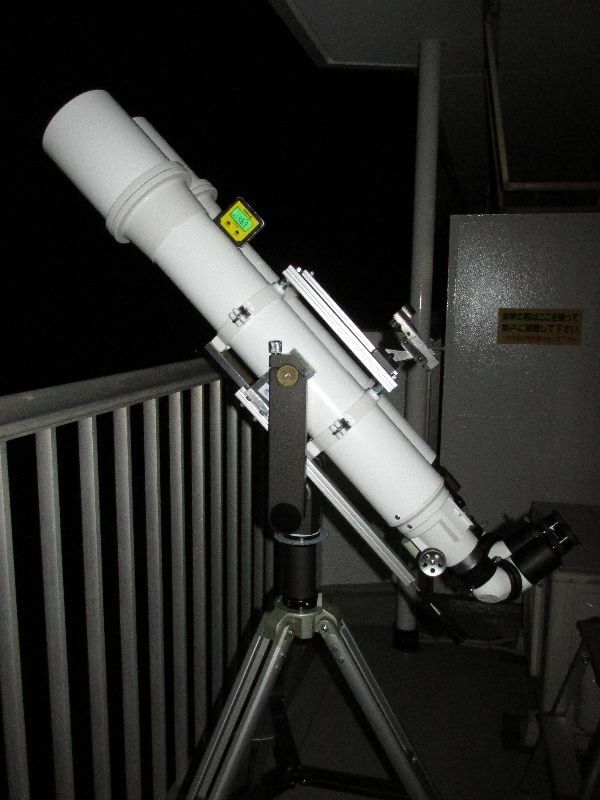 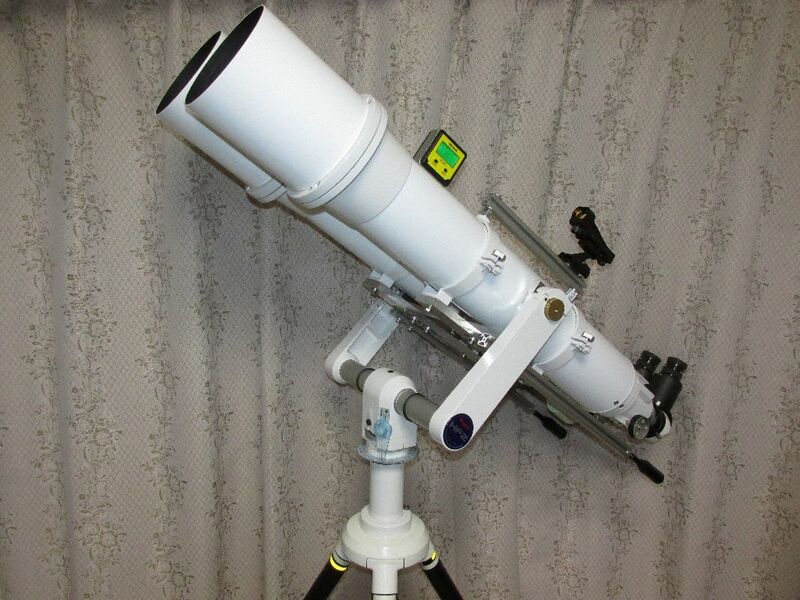 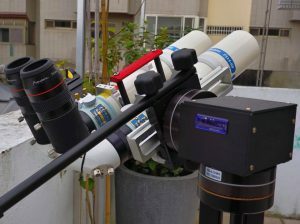 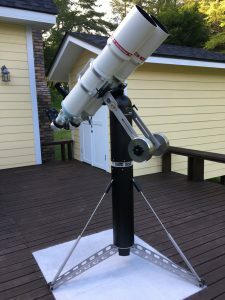 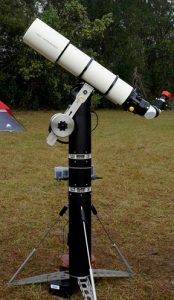 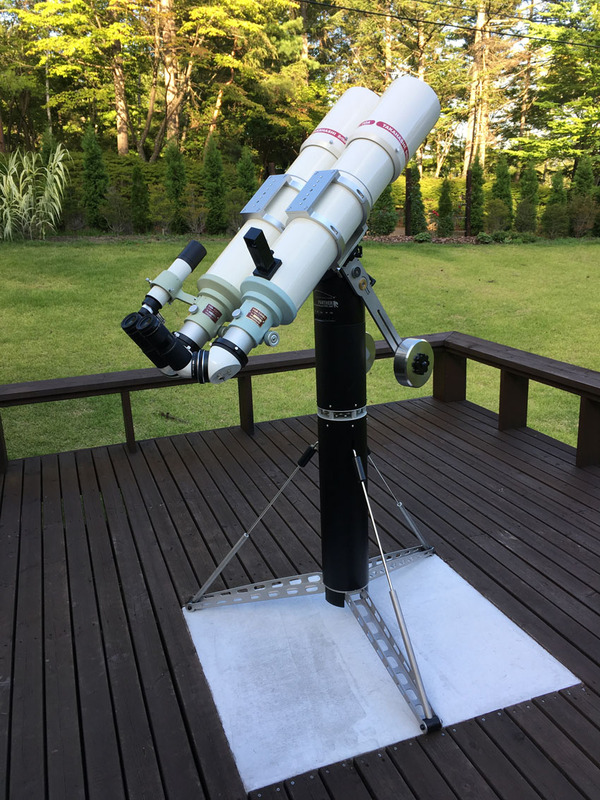 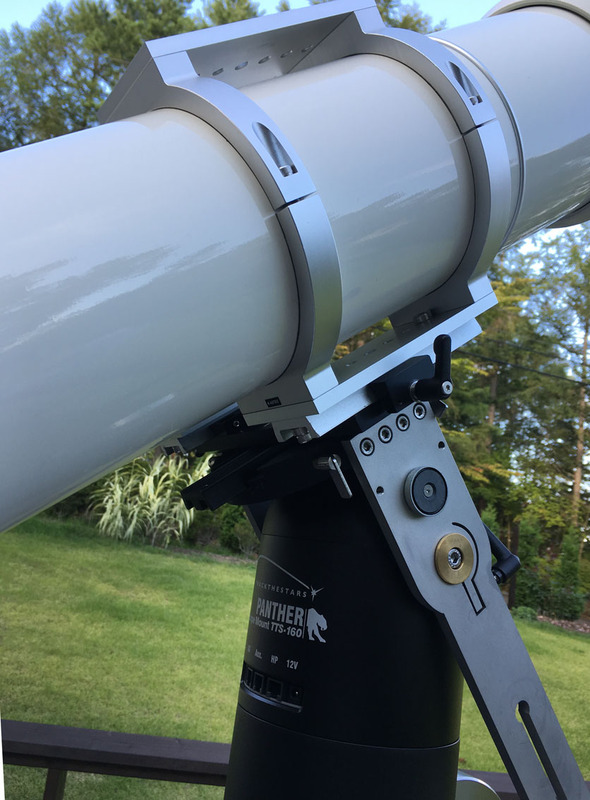 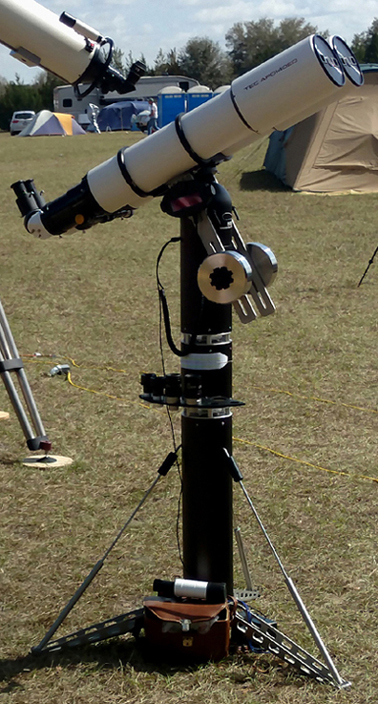 Here is also a picture of my new 18” scope, it took me about 5 months build it. 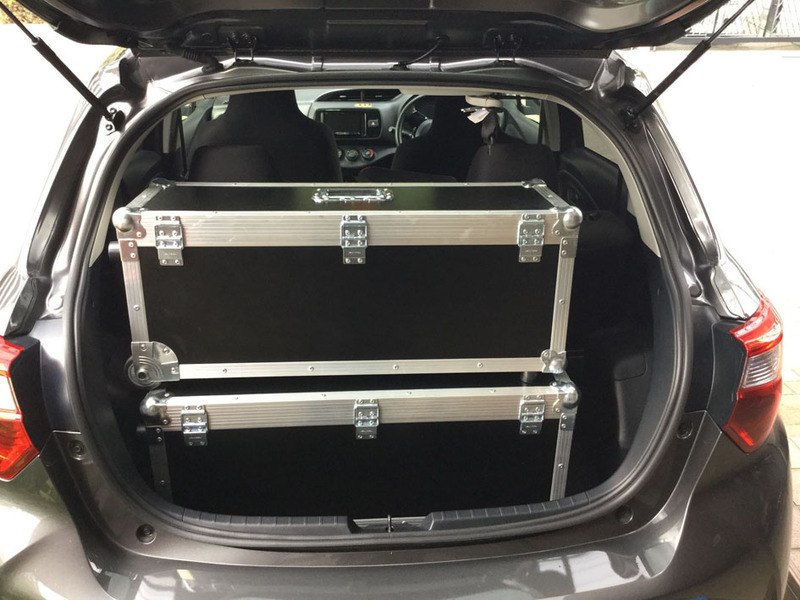 the 18” is in a welded aluminium structure with carbon fibre poles and kevlar/carbon baffle. 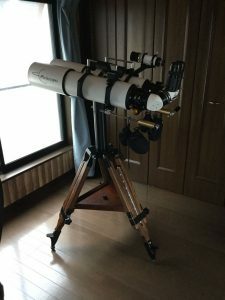 It is an F3.5 so I can stay seated even when looking at zenith. 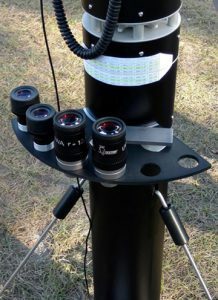 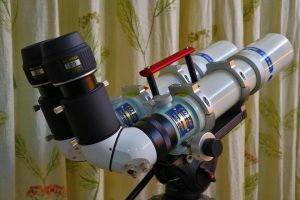 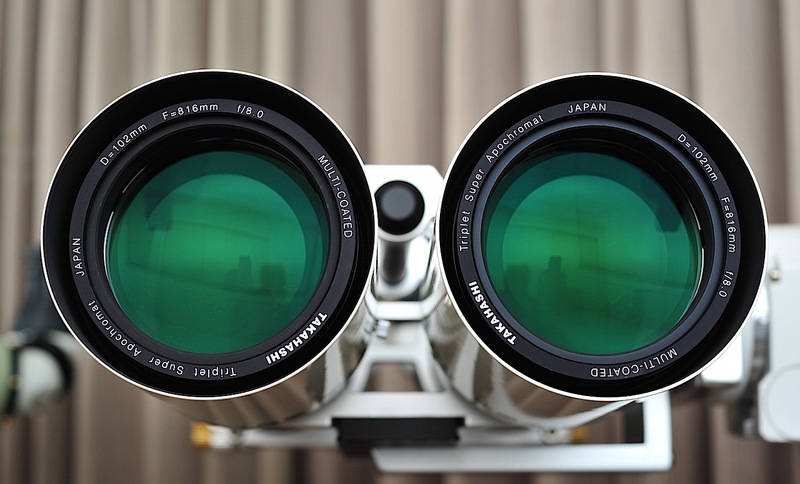 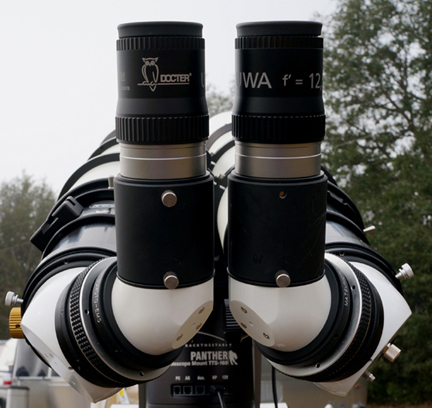 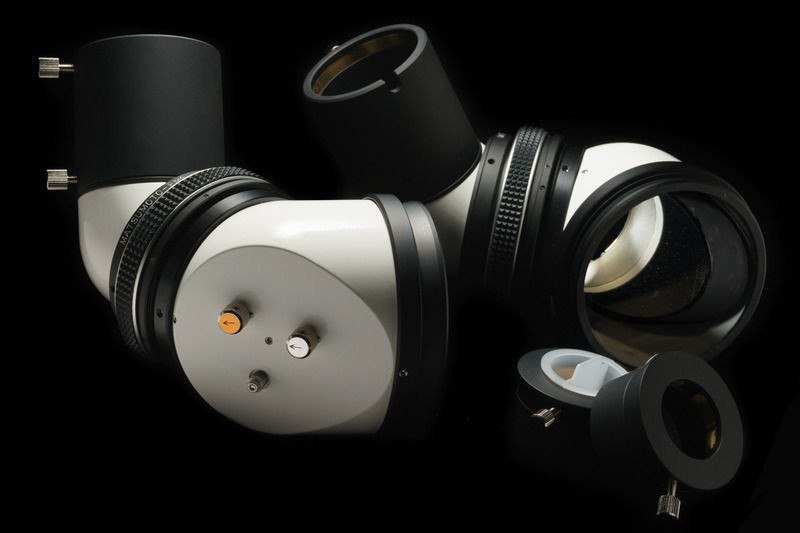 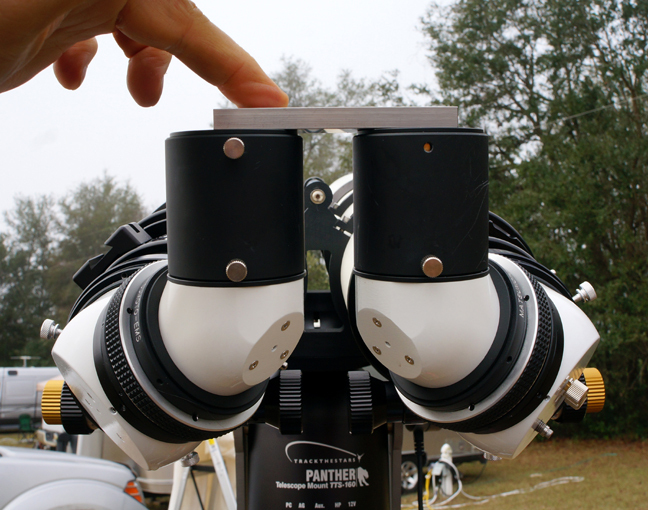 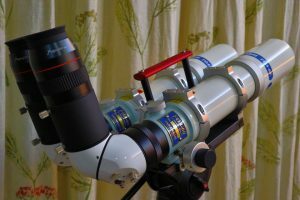 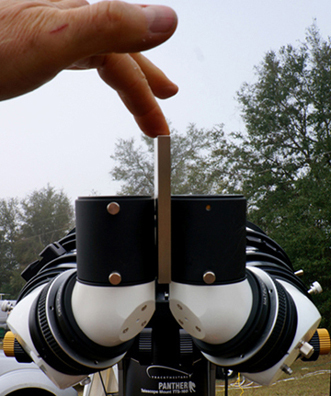 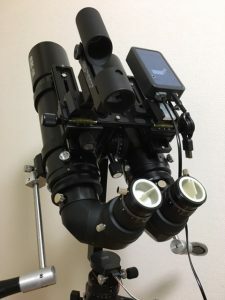 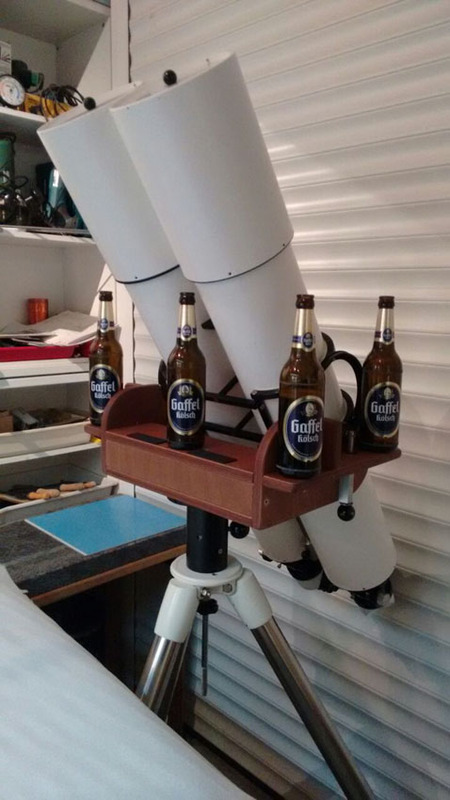 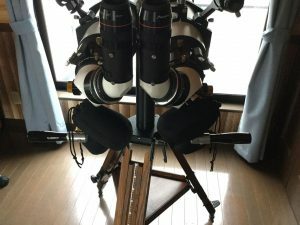 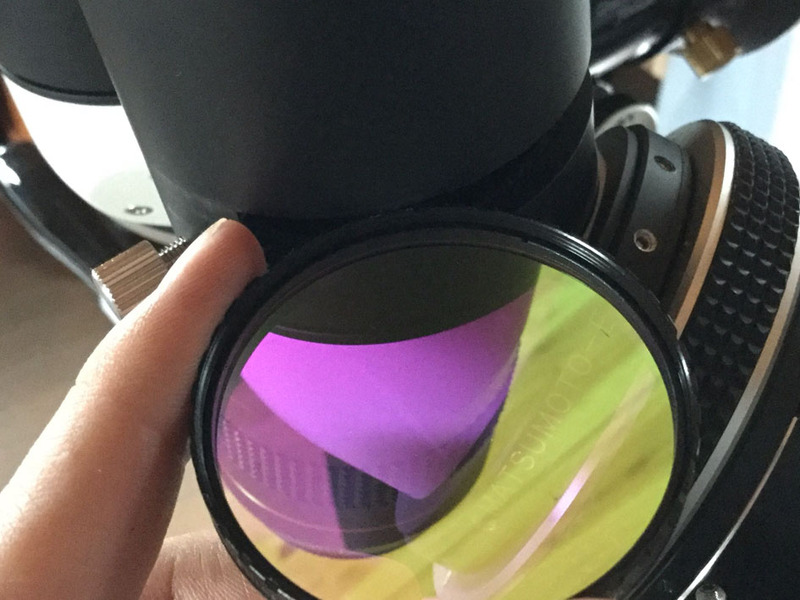 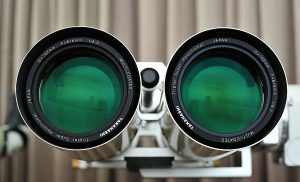 I find the binoscope is a great complement to the big scope. 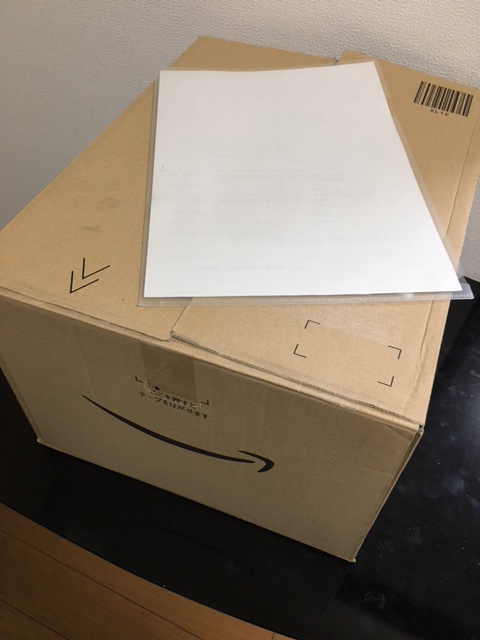 Thank you very much for your thrilling report. 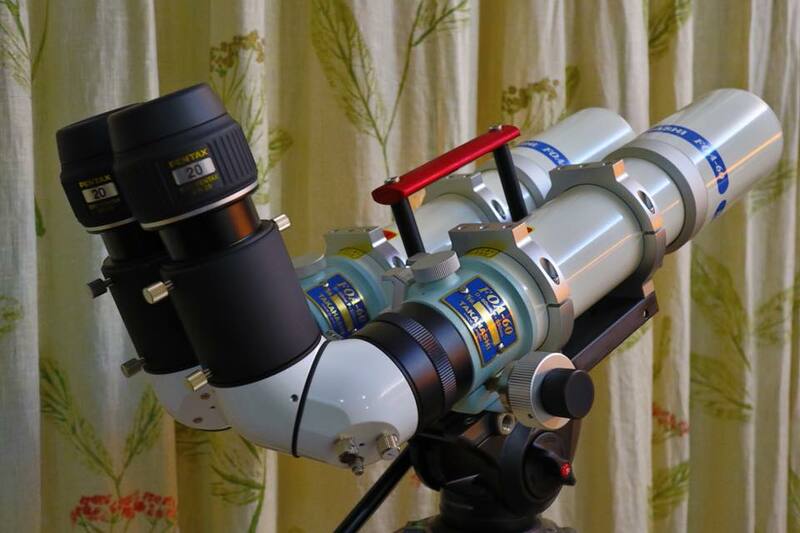 Congratulations on the successful reform of your TSA120-BINO into 102S-BINO and finishing the splendid 18”scope. I am looking forward to have your further report after watching the targets of seasons. 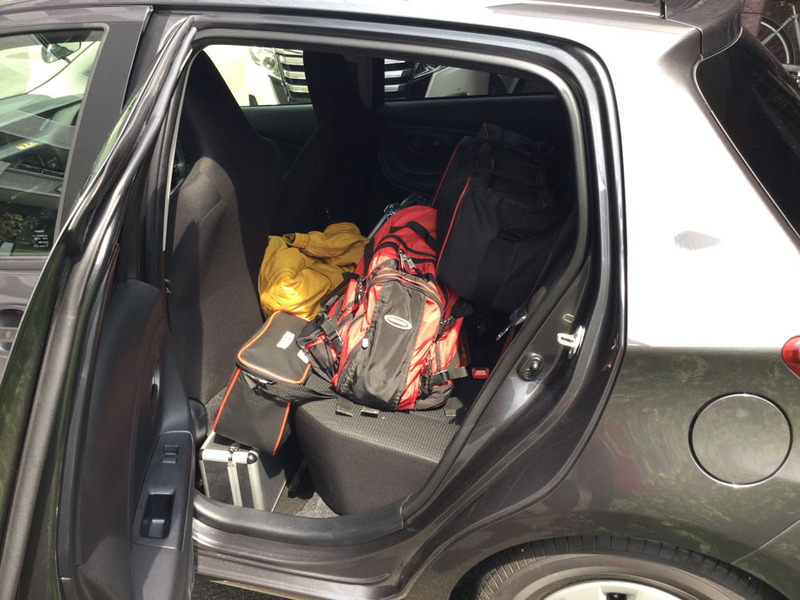 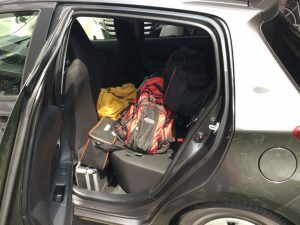 Thank you for allowing me to post your report to my website. I love the little FOA-60, great performance⋯ now double the good 🙂 ～ EMS make it all possible. 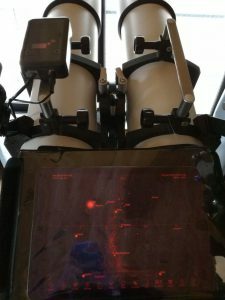 Thank you for every advice driving the project to complete!! 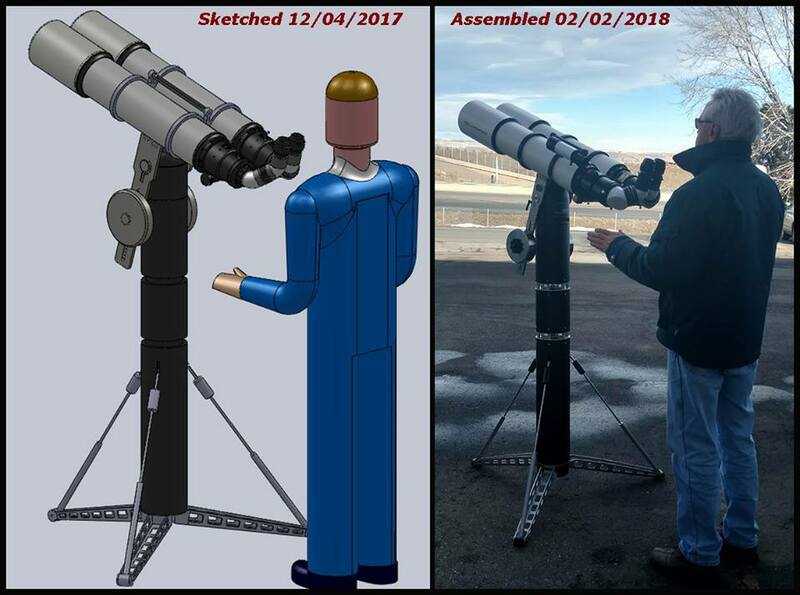 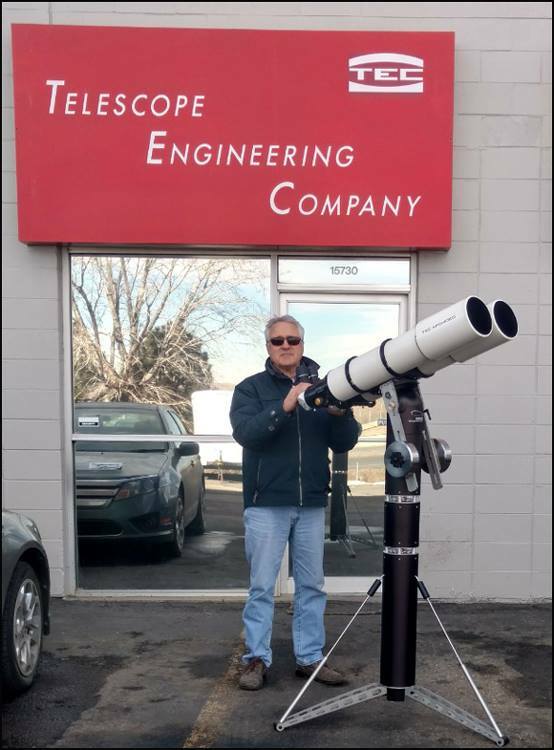 Congratulations on the completion of your another Binoscope ! 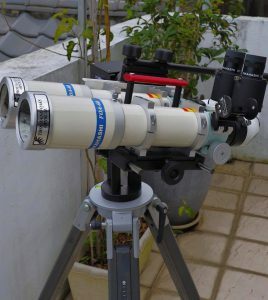 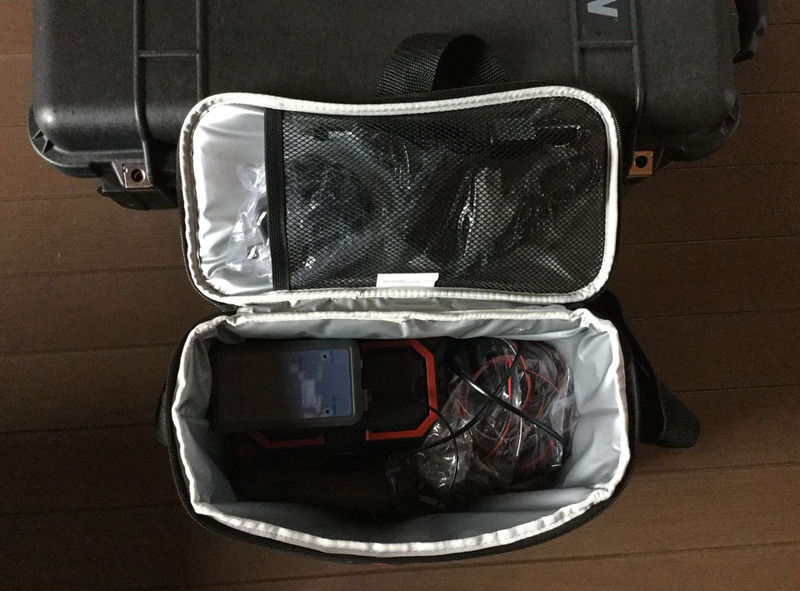 I am very happy to have another Binoscope Expert in Taiwan. Fabulous photos of completion of the LZOS 152-BINO have arrived. 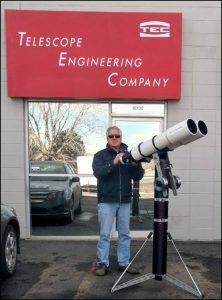 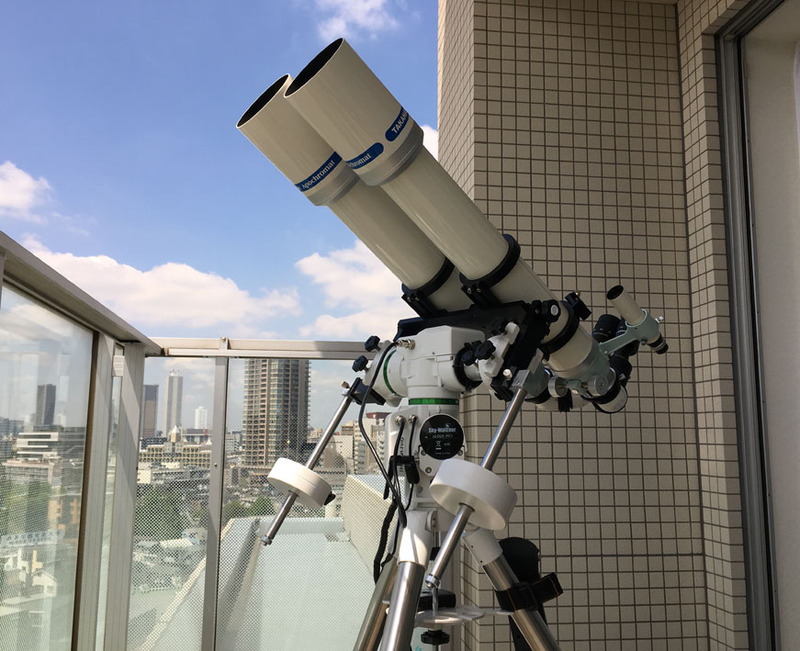 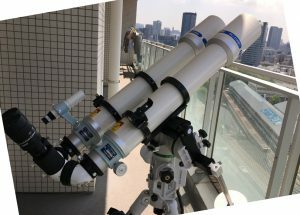 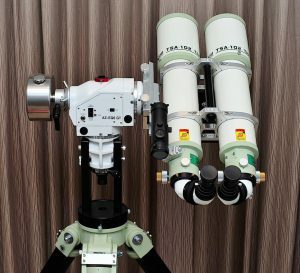 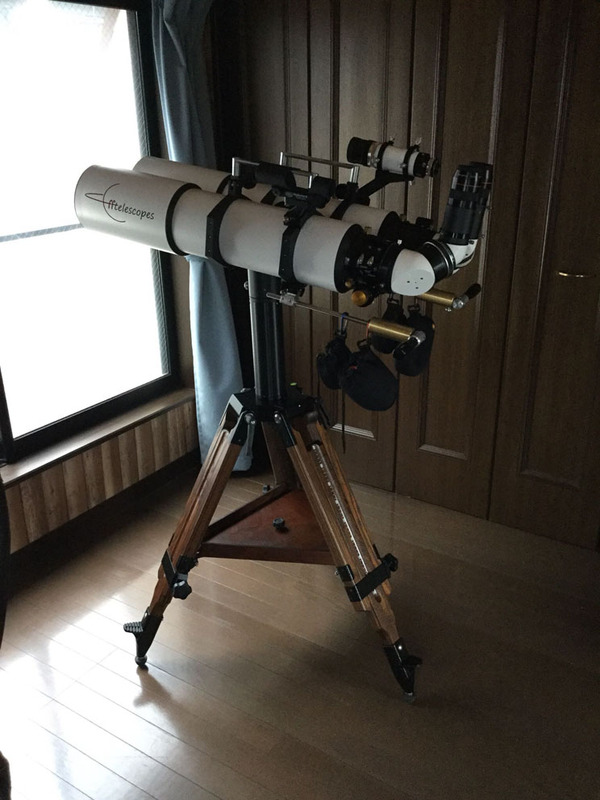 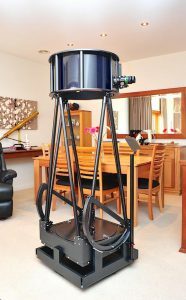 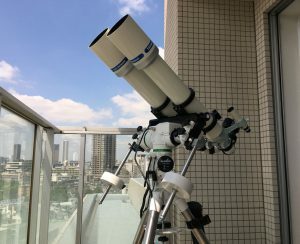 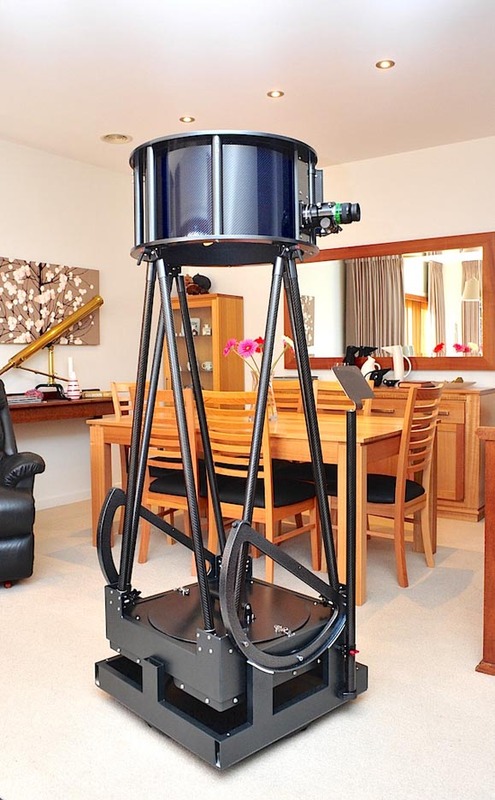 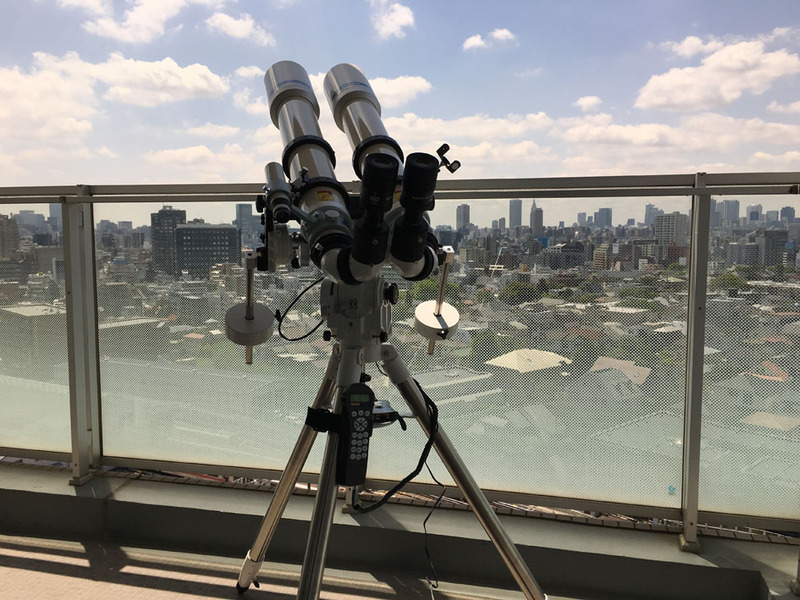 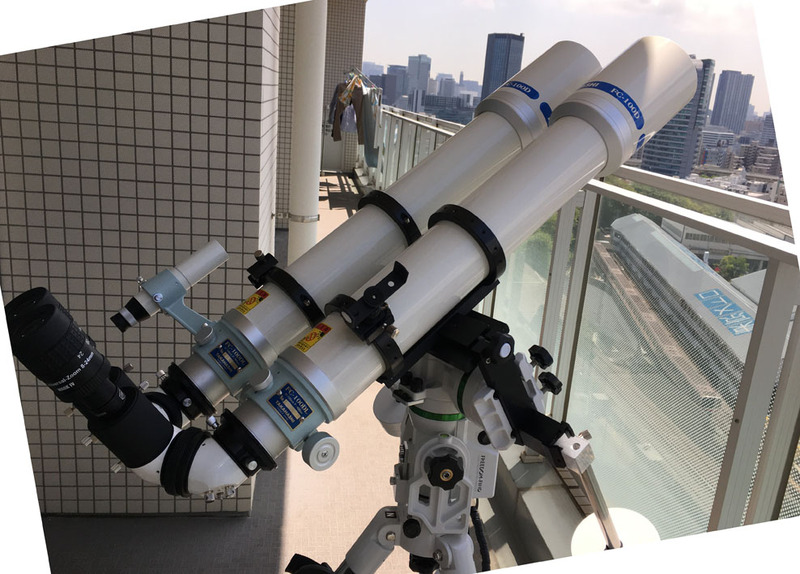 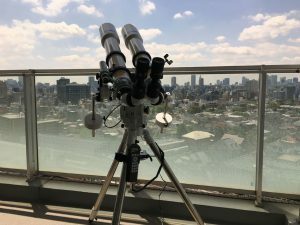 I would like to give the biggest applaud on the attitude of the CEO of the Telescope Maker himself taking the active part in making Binoscopes, and very eager to study the concerning affairs. 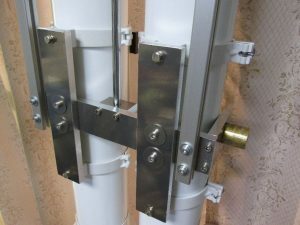 The frame-work looks very simple and light, but very rigid. The large trunnions will promise the smooth and steady operations. 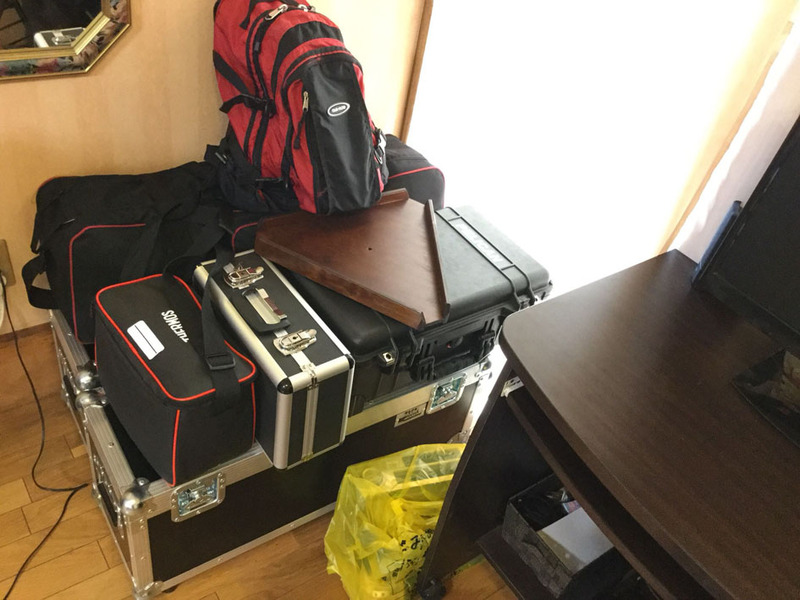 Congratulations on the completion of TEC140-BINO, Yuri !